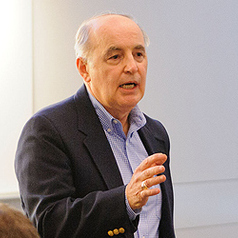 Steven K. Wisensale, Ph.D. is a professor of public policy in the Department of Human Development and Family Studies at the University of Connecticut. His primary teaching responsibilities and research interests are in family policy and aging issues. He has received three university-wide teaching awards (and two departmental awards) and was given a research award by the Northeastern Gerontological Society. Wisensale is the author of more than 75 journal articles, book chapters, and policy briefs and has published three books, including "Family Leave Policy: The Political Economy of Work and Family in America." He has received three Fulbright Awards – one in Germany, another in the Czech Republic and a third in Japan – and is a former Research Fellow of the Gerontological Society of America. In 1999-2000 he was a consultant to the United Nations on world population aging and, over the years, he has served on seven state task forces in Connecticut. In 2017, he was a Fulbright Scholar in Japan, where he taught a course on Baseball Diplomacy in U.S.-Japanese relations at two universities.